Saturday I took advantage of the nice weather and spent much of it walking the banks of and wading in a few limestone creeks in the Lehigh Valley in Pennsylvania. It was chilly when I hit the first stream in the late morning, but the sun was bright and quite warm despite the breeze that sometimes kicked up a few notches to a light wind. The fresh snow of mid-week lay on much of the ground slowly melting, its run off mixing with the creek and coloring it the shade of tea with a touch of milk. 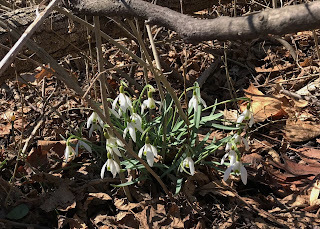 And among the brush and tree roots along the river banks, the first flowers of the year bloomed in small clumps, snowdrops. At the first stream I fished nymphs in all the runs, pockets and pools that I know from years of fishing this creek hold wild brown trout that range in size from 5 inches to over 20 inches. I know I was getting my fly deep enough as I lost a few to the rocks that cover the bottom, but the trout just weren't interested. I even fished a few of Doug Freemann's flies to no avail. After a few hours of getting the skunk I needed to warm up so I walked back to my car, broke my rod down, got in and decided to warm up while I drove to another stream a short distance away. When I got to the next steam, I was surprised to see only a few anglers spread out over a half mile or so of water. The sun was high now, and an upside-down, daytime moon hung in the eastern sky looking very white against the deep blue sky. The river was a little high, clear and a little "warmer" than the first creek I fished at 42 degrees F. I rigged up again with a small beadhead pheasant tail and drifted it through every seam, foam line and pocket over a few hundred yards of water working upstream. 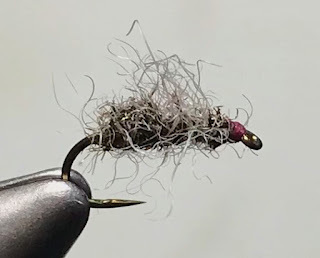 I switched flies a few times, lost a few, and managed to get one hit that was on for the length of time it takes the fish to turn and show one its tail. By now it was mid afternoon and it being a beautiful day after several weeks of periodic snow storms, windy days and temperatures below normal, I wasn't going anywhere without catching at least one. I walked back down stream slowly scanning the banks and foam lines trying to will a trout to show itself. 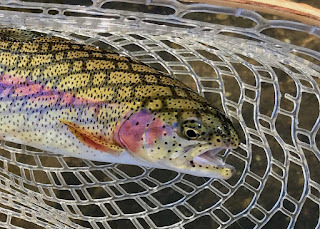 Sure enough, across a long, slow pool where a partially submerged log created a thin seam below where it split the current, a trout rose and took something off the surface. A few seconds later it rose again, and I thought, "It looks like a dink, but what the hell." I quickly redid my leader, added a two foot section of 6X tippet and tied on a #20 Matt's Gnat. There being a lot of brush along the bank, I had no room for a back cast so I dropped below the fish and waded out far enough that I could get a back cast over the stream below. My first cast pushed the fly past my target just off of the log, so I let it drift through and below the fish, and the fish rose again. The next cast was good, but the fly dragged a little and went untouched. I waited and the fish rose. The next cast landed about a foot above the fishes last blip, drifted a short way and then was sipped in confidently. 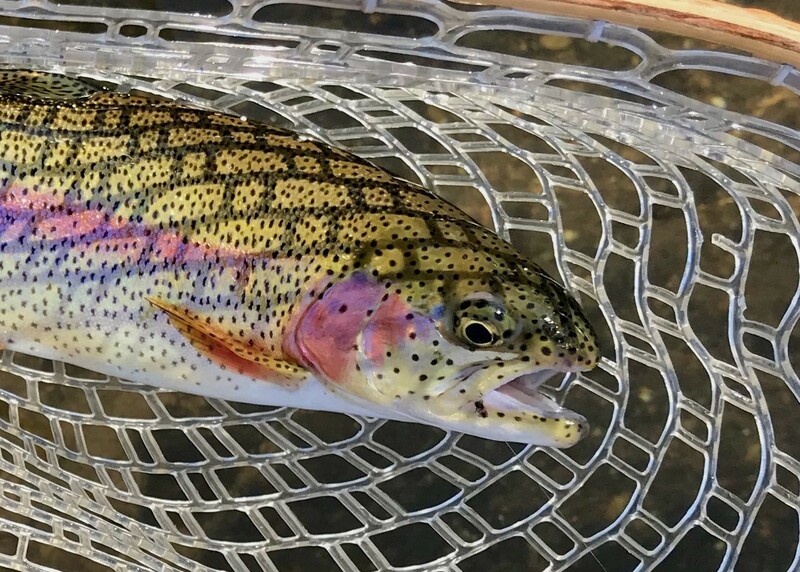 After a spirited battle, I worked my net under the fish and lifted the rainbow you see above. It measured about 12-13 inches long. I took the pic, removed the fly without touching the fish, and lowered it back into the drink when after a brief rest, it swam out and back to the deep, dark flow along the log. Over the next hour or so I walked the bank back down to where I started and took two more fish, both browns, and both of them on the same fly I took the first fish on - the fly you see above. I would have been more than happy to have had headed home with the just the first fish, and really wasn't expecting to see any more rises after that. Some days are like that; nature gives you a rainbow and a pot of gold. It's funny how they key on small flies. 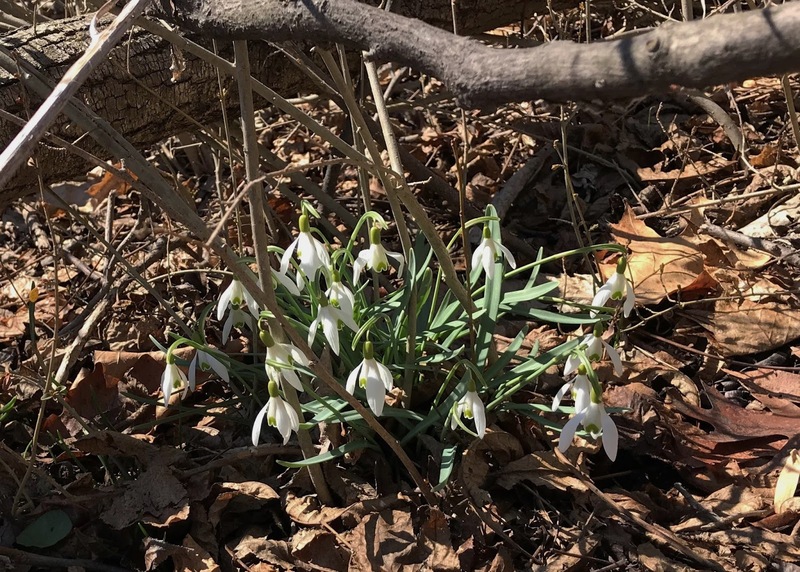 Nice to see some flowers blooming.